Garden sheds are the perfect addition to a backyard for any gardening enthusiast. Imagine how easy it will be to get all of your favorite flowers and vegetables planted with your gardening supplies close at hand. Besides small hand tools, they can store lawn mowers, tractors, and various other gardening supplies. Plus, they’re a great option for storing fertilizers, pesticides, or herbicides since they can't be kept indoors. 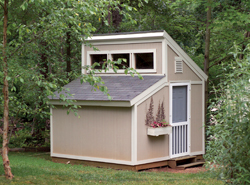 Building a garden shed plan in your backyard will instantly provide the perfect solution for easy gardening. 562 Sq. Ft., Width 24'-0", Depth 28'-0"
188 Sq. Ft., Width 14'-0", Depth 14'-0"
288 Sq. Ft., Width 32'-0", Depth 16'-0"
192 Sq. Ft., Width 16'-0", Depth 12'-0"
320 Sq. Ft., Width 20'-0", Depth 16'-0"
224 Sq. Ft., Width 16'-0", Depth 16'-0"
360 Sq. Ft., Width 20'-0", Depth 20'-0"
448 Sq. Ft., Width 14'-0", Depth 16'-0"
272 Sq. Ft., Width 20'-0", Depth 16'-0"
423 Sq. Ft., Width 24'-0", Depth 20'-0"
Our collection of garden shed plans includes many styles and sizes perfect for your gardening needs. We offer easy-to-follow blueprints that allow you to picture the finished project perfectly. With a wide variety of plans, we are sure that you will find the perfect do-it-yourself project to fit your needs and style.